Hi everyone! After a week of frigid cold temps, cloudy skies, and even a crazy weekend snow shower, the sun came out and spring arrived! 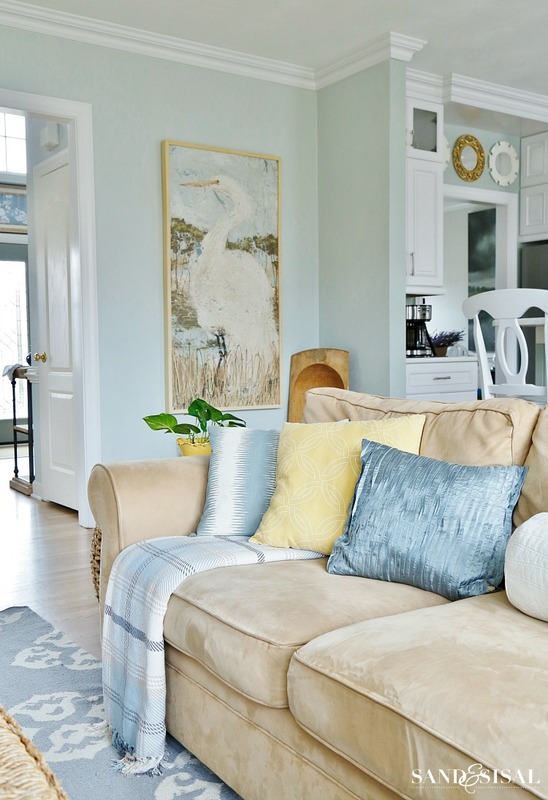 Today I’m sharing my Spring Family Room and Kitchen Tour and participating in a Spring Home Tour with 30 bloggers, hosted by Marty at A Stroll Thru Life. If you are arriving from Remodelando la Casa (one of my favorite bloggers) then welcome! 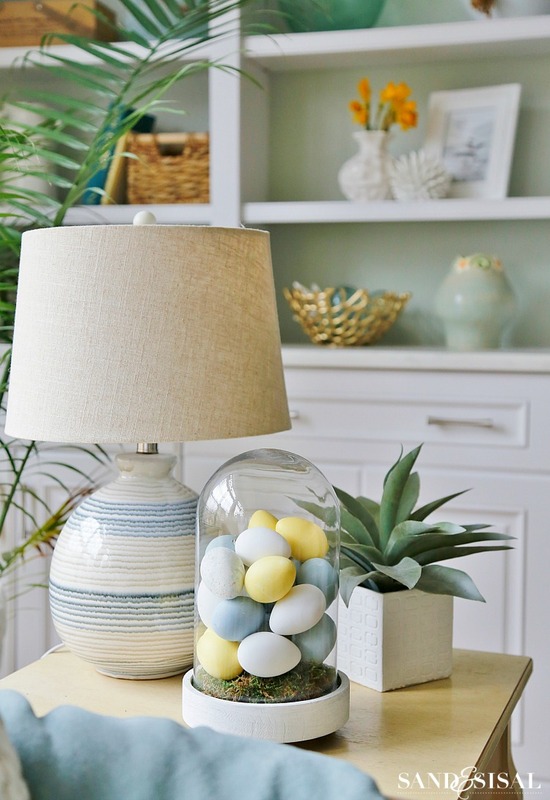 When it comes to spring decor, I enjoy a fresh, clean and uncluttered look. The first thing I love to do is bring in lots of botanicals. February and March is when retailers start receiving shipments of lush indoor plants like majestic palms, fiddle leaf figs along with bright and cheerful potted bulbs. Our backyard has two very large forsythia bushes, which are in total full bloom right now! Unfortunately we planted them on the side of our house and they can’t be seen from any window, but thankfully I can bring in long clippings and force the blooms each year. The forsythia branches look bright and pretty paired with yellow daffodils on our new wood beam mantel and marble herringbone fireplace. 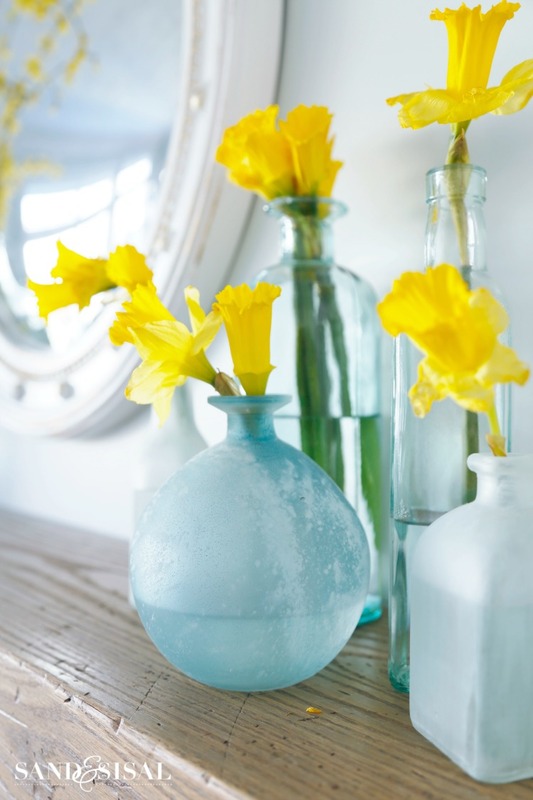 You can’t beat free flowers from the yard in sea glass vases! Our grocery store had these amazing yellow hydrangeas that I couldn’t resist. Are you sensing a color theme yet? We’re celebrating spring with shades of blue and pops of yellow. The yellow and blue pillows were pulled from our playroom and my daughter’s room. I promised myself that I would not buy any more pillows this spring since honestly, my linen closet can’t hold anymore. Instead I used these easy to make envelope pillow covers. I filled a cloche with painted Easter eggs for a quick and easy 5-minute display. Spring means spring cleaning. The kitchen received a top to bottom cabinet wipe down. 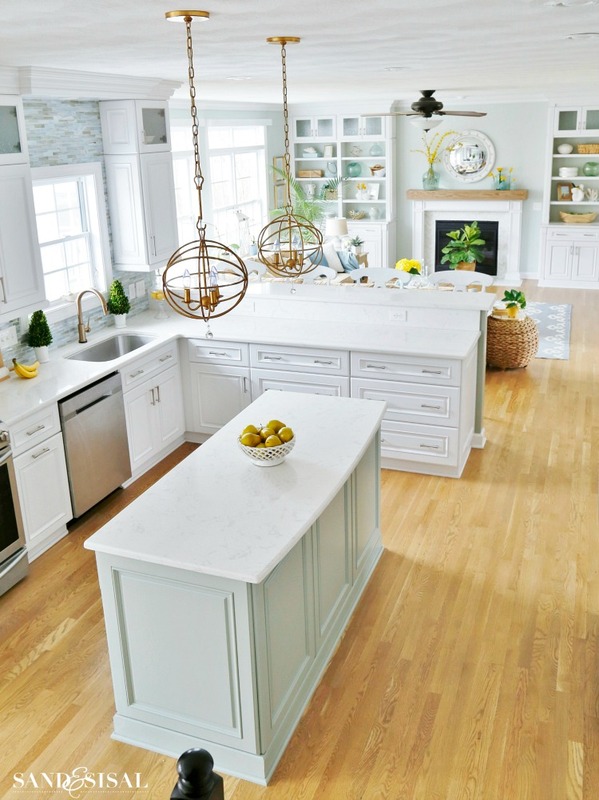 A sparkling clean kitchen is a rare occassion in our home. This lovely view lasted all of one afternoon before the family arrived home. My birthday present was the new gold bamboo chandelier from Ballard Designs. I love how it elevated the space but once it was up, the farmhouse styled kitchen chairs looked out of place. So I shopped our house and switched them out with the dining room chairs and pulled in the linen bench. The X-back chairs compliment the chandelier and look so much nicer. I’m not sure if I’ll keep them there but it’s fun having them there for now. The whole space came together nicely for spring! Thanks for stopping by spring family room and kitchen tour! If you missed our dining room all decked out with beautiful lavender faux florals, click HERE. Catch up on the home tours with the links below. Next stop on the tour is Debra from Common Ground. Very pretty! Everything looks so clean and fresh! 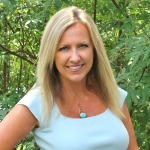 I just discovered your blog on the spring tour and love your home. Would you be able to tell me the source of your lamp next to your sofa? Love the blue and white! Thanks so much for sharing! Beautiful! 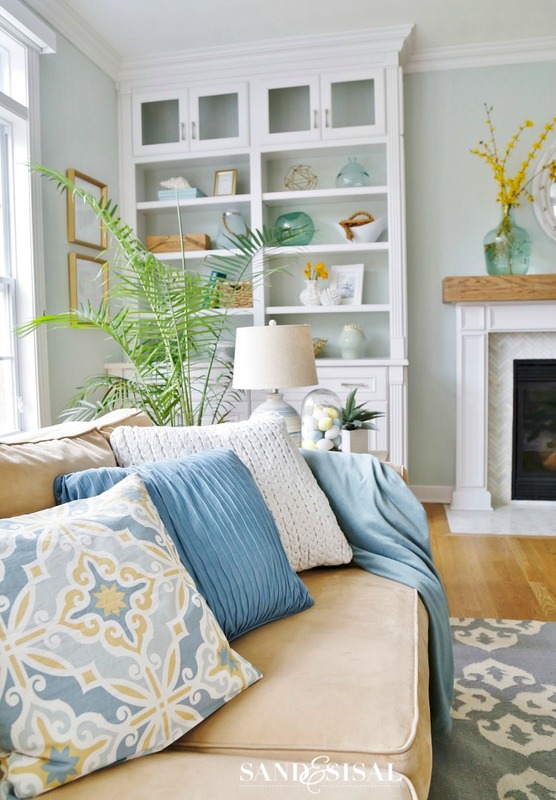 Your home is filled is beautiful colors perfect for spring. So well done! Thank you Julia! I appreciate that! Everything looks so fresh, clean, and springy! 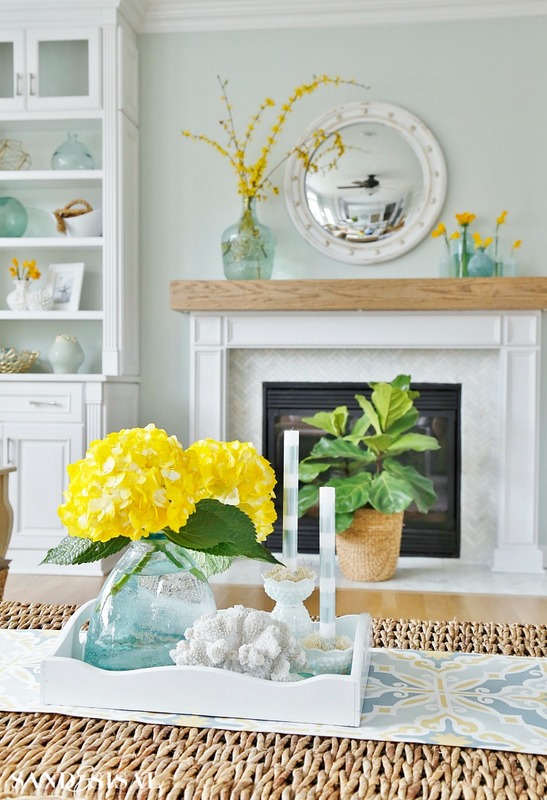 I love your touches of blue and yellow and those yellow hydrangeas are amazing. Thanks sis! Those yellow hydrangeas instantly made me smile when I saw them! What a glorious tour Kim! Blue and yellow truly is a perfect pairing for spring. I’ll be featuring you later today on IG. That is so kind of you Laura! Thank you! 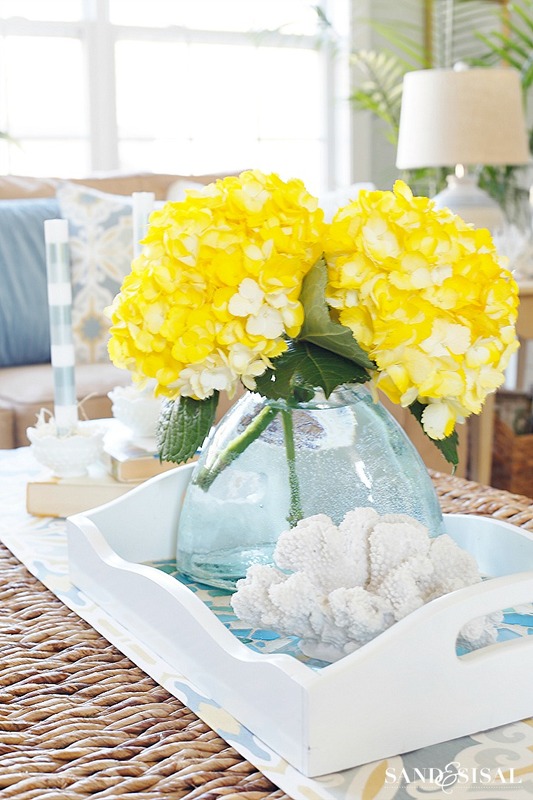 oh my gosh those yellow hydrangeas are SOOOO fun!!! your home looks so cheery- love it, kim! 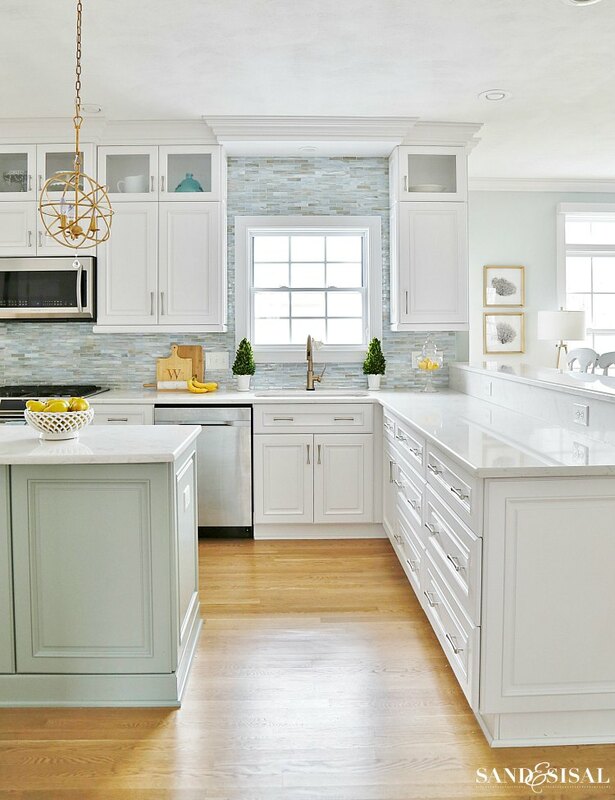 Love the pretty pops of yellow, it looks so fresh and definitely says Spring. I love the new chandy’s too, how perfect and they add a new sparkle to the room. Everything is so beautifully coordinated and I love this space, so open and full of light. Thanks so much for joining the tour. Your home is always beautifully decorated. Thank you Marty for inviting me to join the tour! So many lovely homes are featured! Have a beautiful week! Well, really, first time seeing yellow hydrangeas. Ah-dorable! Now, touring your home is just like going thru the pages of my favorite decor magazine. Picture after picture.. perfection! Awwww, you are so sweet Cristina! Thank you! I saw those hydrangeas at my grocery store and instantly smiled! So bizzare but cool…. I had to have them! ($3/bloom). They only had 2 blooms. I really needed 3 but oh well, they made me happy. It’s so nice to be on this tour with you! So very beautiful! Is the wall color Sea Salt? You have a very keen eye for color Valerie! Yes it is! Thank you! LOL!!! I know right? I think secretly it’s the reason why I do home tours… to have a clean house for a day or two! The upstairs is a hot mess though. Thank you for the photography compliment! I appreciate it! I’d love to chat about photography, inbox me! Beautiful. I love all the colors and the clean look. I have recently moved to the English Lake District area for two years.We are renting a barn conversion in the country. My decorating style is similar to yours and I appreciate how it looks in a different setting here. Thank you Lorraine! A barn conversion sounds so intriguing! I’d love to see it! I love the touches of grey and yellow all around – spring perfect! So honored to share this home tour with you Kim! Kim, I love love love this room. I wish I could go there and have a chat with you right now. One of the first things I would ask you is what is the paint color on your walls? I want to paint my kitchen this year and get rid of this blue but I’ve had for three years. Your blog is part of my very very favorites. Thank you Rita! All my colors are by Sherwin Williams. 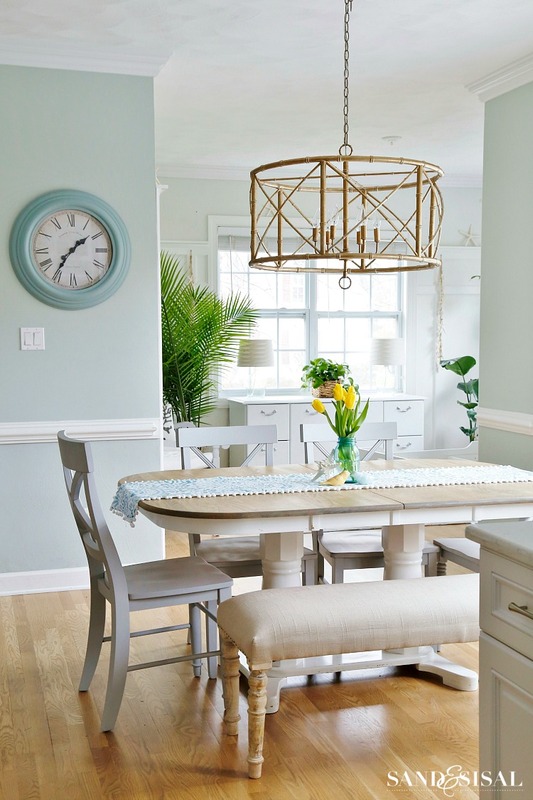 The Family room is Sea Salt, the kitchen and eating area is Comfort Gray, which is just one shade darker on the swatch. As usual your home look beautiful, Kim! Everything looks so clean and fresh. The pop of blue and yellow just screams Spring! Love you new chandelier. It’s perfect! Have a great week! Love the colors in your house. Who makes the color for the sea salt? Thank you Kat! Sherwin Williams makes Sea Salt. I’m just so in love with all the blue and yellow! So gorgeous!! Kim, your home always looks so fresh and pretty! 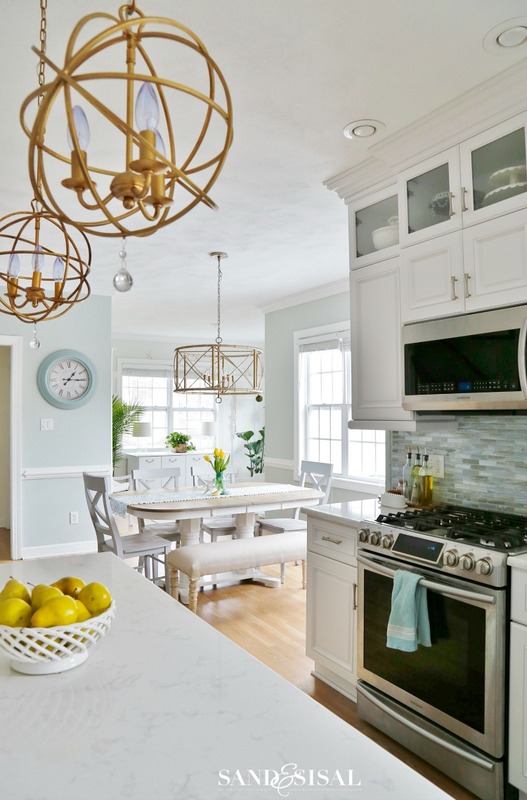 I LOVE all of the splashes of yellow, and I’m still swooning over your new dining room light fixture. It’s fabulous! Thank you Jennifer! I’m loving the new chandelier too! What a beautiful home. So bright and light, perfect for Spring. I love your living room table runner and the matching pillows. Would you mind telling me where got them? Thank you Bettina! I made them! The runner is just a strip of fabric, pressed and pinned at the seams. It isn’t even sewn… yet. I’ll get around to sewing and completing it soon but if you have left over fabric a runner is super easy to make even without sewing. I have the matching pillow cover tutorial on the blog (type “pillow” in the search bar). The rest of the pillows (blue & white) are from HomeGoods. Hope that helps! I love love love your home!! 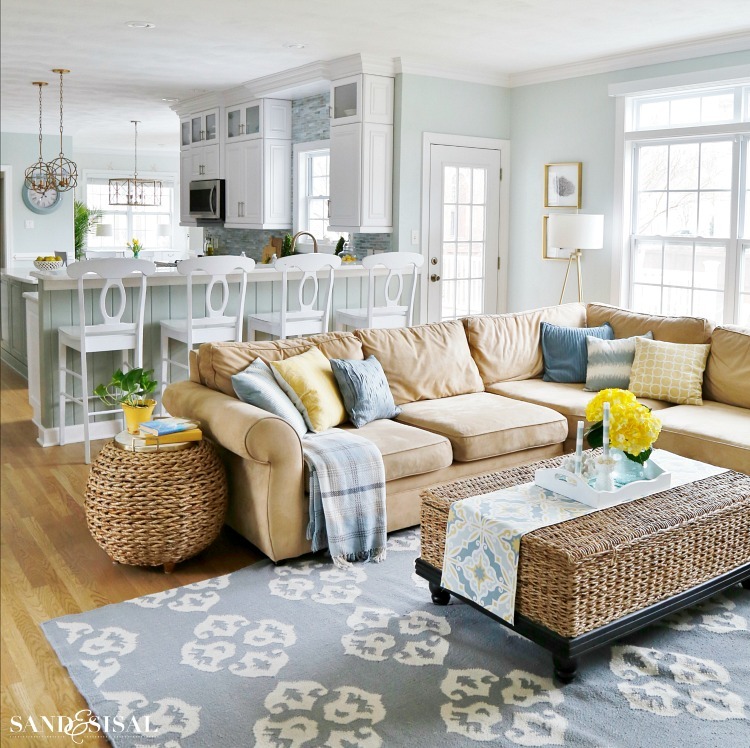 Could you please share where you purchased the blue rug in your family room? What a beautiful home. So clean and bright. I don;t think I ever saw yellow hydrangeas, beautiful! I also love the lamp and the wicker/rattan table and coffee table. Very nice! Hi! I just discovered your wonderful blog! 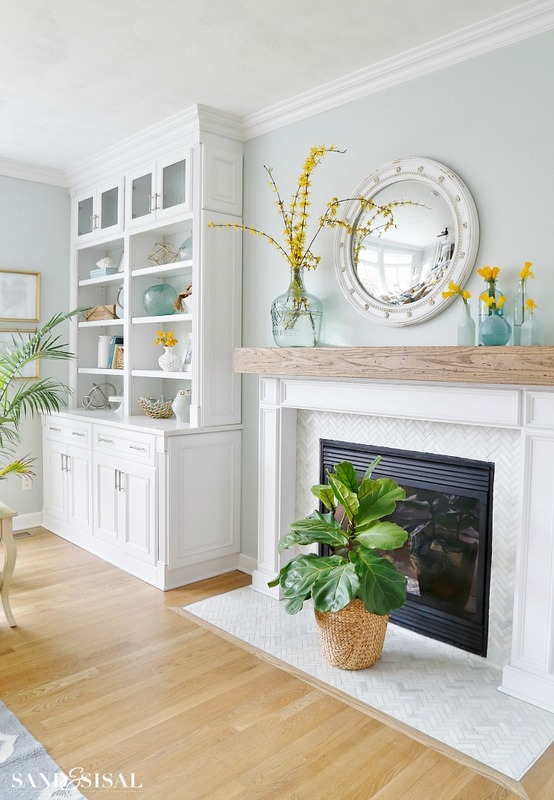 I have been trying to tie all of my ideas of sea glass colors, whites, wicker, rustic mantel etc. together and your pictures and vision have really helped clarify a design scheme for my home. Thank you!!!!!!! Quick question, the Sea Salt paint that you use on your walls in the living room, did you do 50% white? Or the standard Sea Salt color? I purchased some paint today in Sea Salt and it looks a bit darker than yours, so I was wondering! Thanks again. Thank you so much for your sweet comments! 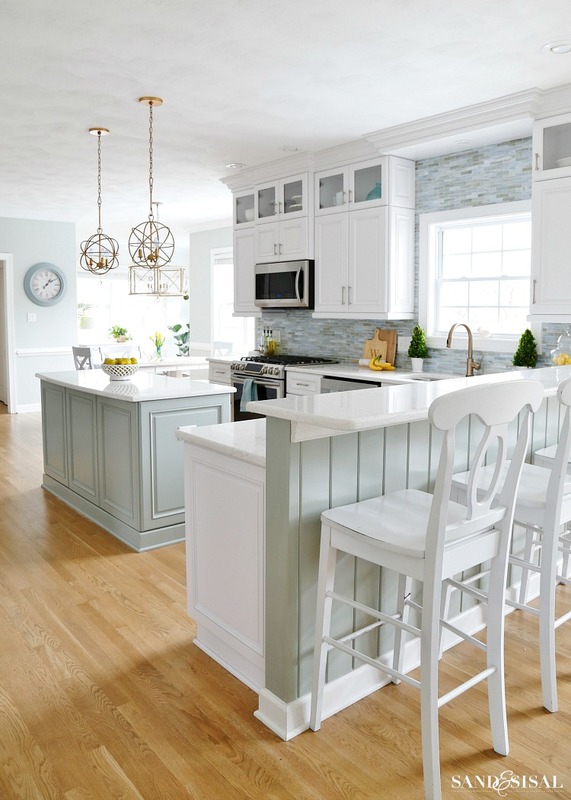 The beauty of Sherwin Williams Sea Salt is that it looks so different depending upon the lighting. It also looks different if you painted it over a darker color. Sea Salt will look grayer in shade and then can look vibrant and quite blue in bright sunlight. I have it on the southside (sunny) of my home and it looks like robin’s egg blue, and I have it in our family room (northside and shady) and it looks blue-gray. As I always say, do not rely on computer pictures. Buy a sample can and paint a 4×4 foot swatch on your wall in several places. Only then will you know if the color works for you. Thank you Kim for getting back to me! I think my room is a bit darker than yours, hence why the paint shows up differently. Will experiment with different colors. Happy New Year! just found your blog. Love at first site! Thank you so much Mary! You just made my day! Thank you so much! The family room is Sea Salt by SW. The bar and island are Oyster Bay by SW. The kitchen walls are Comfort Gray by SW. 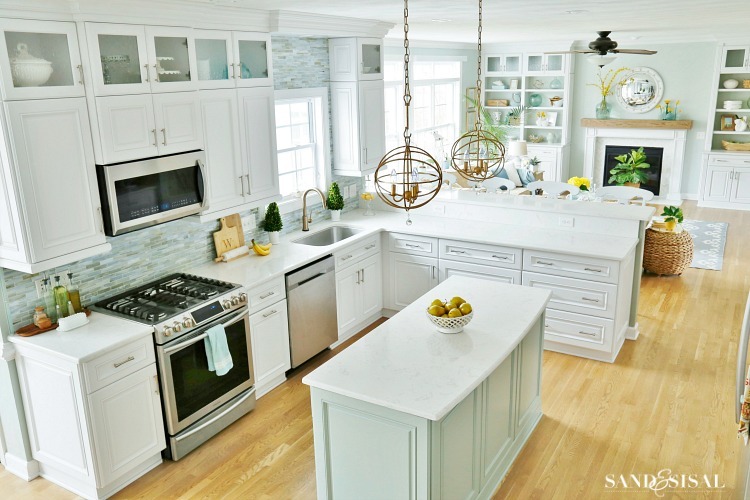 The white cabinetry is a custom white but Extra White by SW is almost identical.